Stanislaus State Stockton Campus is a proponent of higher education's role in improving the economic, social, and cultural life of San Joaquin County. Working with other institutions, the Stanislaus State Stockton Campus offers collaborative initiatives and programs to benefit the community. It provides an opportunity to create a unique environment for learning and to form strategic partnerships with various businesses, organizations, and institutions in the Stockton area and beyond. Wellness WORKs! 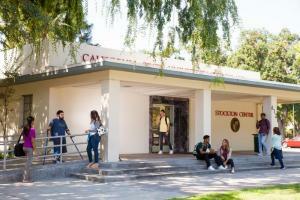 is co-located at the Stockton Campus in University Park, and provides wellness classes and activities to San Joaquin County CalWORKs participants. It is a partnership between Stanislaus State and San Joaquin County Mental Health Services, the agency that contracts with the University to specifically serve CalWORKs recipients. Since December 2000, Work Wellness: The Basics - a curriculum of topics and activities based on a holistic model of wellness - has been offered two to three weeks each month. To date, more than 5,000 recipients have attended classes at Wellness WORKs!